The long-awaited mystery of what would occupy the old Tacoma Narrows Airport restaurant has been answered. And many other amenities have been added since Pierce County purchased the property from the City of Tacoma two years ago. Deb Wallace, Pierce County Public Works and Utilities Airport and Ferries Administrator, is responsible for the airport, and she has high hopes for its future. already involves monthly committee meetings. The committee includes an airline pilot, current-use tenants and community members who will look for a balanced approach to the airport’s needs and growth. Many have voiced concerns over runway lengthening and the possibility that it will invite larger planes and eventually turn the Narrows airport into a mini Sea-Tac. But Wallace and the FAA say they have no intention of creating that kind of market in Gig Harbor. thousands, Wallace said. Any runway extension would allow for a greater safety margin for existing business-type jet aircraft and general aviation users. 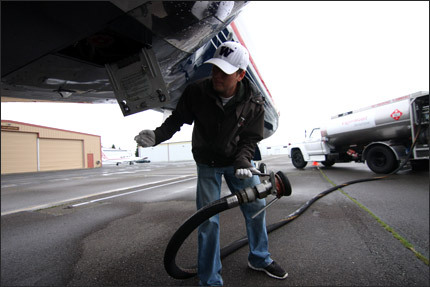 As it stands, some of the larger corporate aircraft, when they use the airport as a destination, have to leave with smaller fuel loads and fly to larger facilities for fuel before they can complete their missions. Any extension or improvement to the runway environment would increase the sales of fuel and other items, thereby boosting the area’s economy. “It will optimize the airport and generate more money for the community,” Wallace said. As far as noise concerns, there already are abatement procedures in place, and modern jet aircraft use much quieter, more efficient engines than their predecessors, she said. Wallace and her husband, John, are no strangers to aviation. She has taken ground and flight lessons and hopes to obtain her pilot’s license. John is a retired U.S. Air Force navigator; he worked with Lockheed C-130 cargo planes and is an FAA-certificated pilot who flies the couple’s single-engine Piper Cherokee 140 airplane. buffer zone was built on the north-end approach to the field. A tunnel was put in place where a gap between the runway’s end and the adjacent east-west road once stood. Should an approaching aircraft develop problems as it attempts to land, pilots would have few options if they were forced to land short. The partially federally funded project was completed and has made vehicle operators safer. Runway striping and taxiway markers also were repainted to improve visibility for incoming aircraft. Multiple types of aircraft operations are performed at the airport daily, everything from scenic flights to flight instruction for both beginning and advanced flight students. Some smaller military aircraft also use the airport’s instrument landing system approach to stay current in foul-weather flying skills. world to do business in the Puget Sound region. Recording artist Taylor Swift recently was a guest at the field prior to her concert at the Tacoma Dome. The airport also has several large and small general aviation hangars, which offer state-of-the-art shelter for the airplanes and helicopters that use the field. The hangars have all the latest safety amenities such as environmental controls and fire suppression. Reflections at the Airport, which opened Sept. 17, is the new eatery located on the main drag and midfield of the airport. General manager Jacques Henry is a longtime Gig Harbor-area resident who graduated from Peninsula High School in 1995.
service business and has worked as a bartender locally, and he wanted to run his own restaurant for some time. Henry’s mother and father, Doug and Susan, are the owners. The Henrys also own and run In Step dance studios in Gig Harbor, and they had used the vacant restaurant building for dance lessons. The Henrys decided to reopen the building as a restaurant when they saw a need from past customers. Executive Chef Roman Aguillon runs the kitchen. His mission is to bring good food, reasonable prices and a family-friendly atmosphere back to the airport. “We offer fine casual dining and plating with casual prices and portions,” Jacques Henry said. Henry said the menu is as diverse as the clientelle of the harbor. Along with the atmosphere, Henry highlights the open-air, covered patio as a great opportunity for diners to watch the sights and listen to the sounds of the airport while they have a great meal. “An All-American breakfast and lunch menu with the dinner service catered more toward a fine-dining edge with the same prices,” are part of Henry’s vision. “We’re trying to let people go out and enjoy a night with dinner, a martini, for under $50,” he said. Along with fine wines, beer, spirits and appetizers, Henry hopes his dedicated group seating areas, which can accommodate up to 15 guests at a time, will bring clubs or large gatherings of families and friends to the restaurant. The airport restaurant has long been the main attraction for weekend pilots and their passengers when they fly their general aviation aircraft to points away from home. Unofficially — and cheerfully — called the “$200 cheeseburger run” for decades, the saying makes reference to the fuel and operating costs of flying one’s own airplane. Tasty and affordable meals are always on the minds of the pilots when they choose a daylight destination. 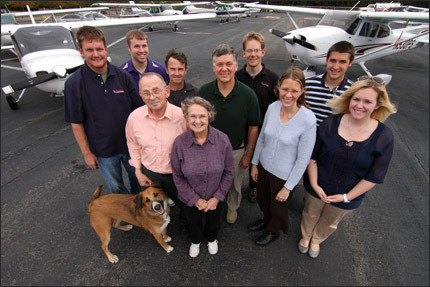 both general aviation aircraft and corporate and privately owned jet aircraft. PAVCO also has been one of the leading aircraft sales representatives for the Cessna Aircraft Corporation of Wichita, Kan. It is owned by Mike and Stephanie Pickett, whose adult children — son Matt and daughter Holly — are a big reason why things keep flying at the field. Mike Pickett started the business after he ran a successful marina in Gig Harbor. He is a retired U.S. Air Force pilot who flew a multitude of aircraft, including heavy bombers and sleek, modern fighters. PAVCO has been at the airport since 1983. Stephanie Pickett brings a business sense and a motherly nature to the family-run company. The Picketts are thinking about retiring eventually, but for now, keeping the doors open and seeing friendly faces is still part of the game.